Published: January 2018 - Penguin Random House. Marie Lu is a huge name in YA and I've wanted to read her books for ages. I'm also a big fan of Batman and superheroes. This novel looked like the perfect story. I buddy-read this book with my #squad, Di and Uma. Go check out their amazing reviews HERE and HERE. I found the writing a bit.....underwhelming. The scenes are vivid and they move like something out of a movie, but the actual word choice and sentence structure aren't brilliant. The writing is average - not particularly astounding. It's too typical. The dialogue is boring. It's completely unoriginal and weak. It's badly written. One of the scenes in the climax (which is supposed to be all powerful and emotional, and I can't say much more cos of spoilers) is severely impaired by its boring, cheesy dialogue, and that totally ruins the mood. The plot isn't great. There's not a lot of action, and not much happens. There were so many amazing opportunities (like that prison break scene) for Lu to have spun the story in an exhilarating direction, but instead she played it extremely safe. It stays cliche, and adds nothing to the original Batman we know and love. It's dry and uninspired. There's also the fact that the incidents that move the story forward are way too convenient. Bruce simply stumbles upon information (like the origami incident) and the climax of the book is easily revolved without much incident. It just doesn't make you go "wow!" It's simplistic and mediocre. I wish Lu could've taken more risks with the story. The characters need a LOT more depth and fleshing out. Bruce is a typical Gryffindor (kinda ruins the Dark Knight image am I right?) and bored me almost instantly. I also wish we could've seen more of how his parents' recent deaths affected him; their absence isn't mentioned much, which I think is a missed opportunity for depth and character growth. Madeline is also a missed opportunity for someone who could've been an extremely compelling anti-heroine. Instead, we're just supposed to buy her connection with Bruce (which is insta-love on his side, and insta-affection on hers) and even though she's supposed to be this dark, dangerous villain, WE NEVER SEE HER FIGHT UNTIL THE END AND EVEN THEN IT'S JUST KINDA PATHETIC. Given her role in the story, I expected more. I didn't want her to go soft so early, and she needed more depth, originality, and personality. But she isn't even compelling. The secondary characters - Alfred, Harvey, Richard, Dianne - are basically disguised stereotypes. I say disguised because I feel like Lu relied more on their legacy in the fandom (for Alfred and Harvey - since they're already established personalities) and didn't bother to add much depth and quirks to their characters. They're all very average. 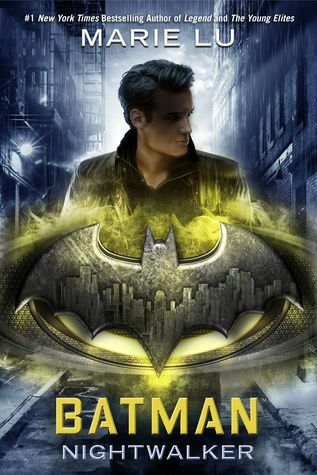 Batman Nightwalker is a missed opportunity. The characters are boring, the dialogue is terrible, and the plot is too simple and convenient. It's a relaxing flick of a story, but it's not memorable or brilliant.